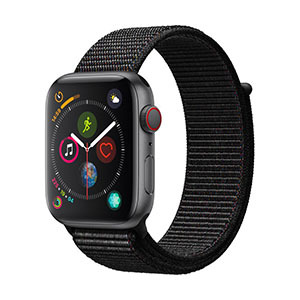 Apple retail partner Best Buy kicked off major discounts on the Apple Watch on Wednesday, offering $100 off its inventory of Apple Watch Sport and stainless steel Apple Watch models for a limited time, marking the lowest price points yet for the wearable. Some shoppers may also find equivalent or better deals at Apple authorized reseller B&H as well. 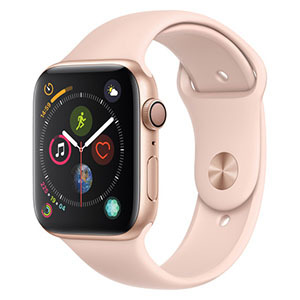 The new discounts mean customers can buy an Apple Watch for as little as $249 for a 38-millimeter, which is the steepest out-the-door price seen on the device since it launched in April. 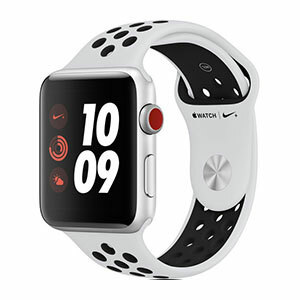 The larger 42-millimeter Sport version starts starts at $299 with the $100 savings, while stainless steel Apple Watch models can be had starting at $$449. Best Buy also ships orders for free. Some customers may find even greater savings with AppleInsider partner B&H, which has also knocked $50 off all models and is including a $50 B&H gift card for free with each purchase. Unlike Best Buy, B&H will not collect sales tax on your order if you live outside New York, and shipping remains free. Therefore, shoppers outside of New York state may find a greater value proposition from B&H's promotion. The Series 4 marks another major upgrade to the Apple Watch. Here the changes are more cumulative -- the first thing you'll notice of course is its bigger OLED display with thinner bezels, matched to 40- and 44-millimeter sizes. This allows watchOS to squeeze more detail into some screens, and indeed a new Infograph watchface can fit up to eight complications. The digital crown has been re-engineered to include haptic feedback, "clicking" as you scroll. More importantly it's part of Apple's new electrocardiogram (EKG) technology, the other components being a ring around the optical heart sensor and a watchOS app coming later in 2018. By holding a finger on the crown for 30 seconds, the app will be able to detect whether you have a regular heart rhythm or it shows signs of atrial fibrillation. Some other health-related improvements include fall detection, which will pop up an option to call emergency services or even make the call automatically after 60 seconds. The Watch's Emergency SOS function will dial 911, notify emergency contacts, share your current location, and pop up your Medical ID information for providers. Further upgrades include a faster S4 processor, a 50 percent louder speaker, and a relocated microphone for reducing echo in phone calls or Walkie Talkie. 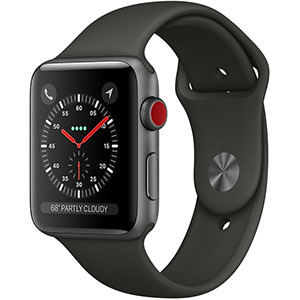 Announced during Apple's Sept. 12, 2018 keynote, the Apple Watch Series 3 comes in two versions: GPS or GPS + Cellular. 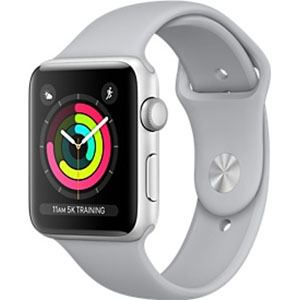 The Apple Watch 3 (GPS) starts at $329 (USD) and is available in three case types: Aluminum, Stainless Steel and Ceramic. 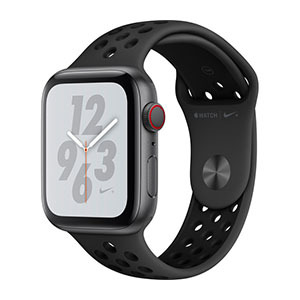 Band types include Sport Loop, Sport, Leather and Stainless Steel. The Series 3 also features a faster dual-core processor compared to the Series 1 and 2, as well as a W2 chip. 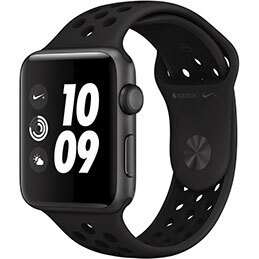 Running watchOS4, the Series 3 provides users with up to 18 hours of battery life and is water resistant up to 50 meters. 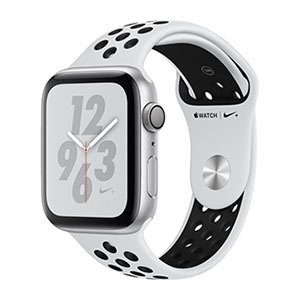 Other features include Bluetooth 4.2 support, a heart rate sensor, and barometric altimeter.